We have had a busy week. The weather was warmer than it has been in a while. On Thursday we even went to the zoo. It was in the low 40s, after all. 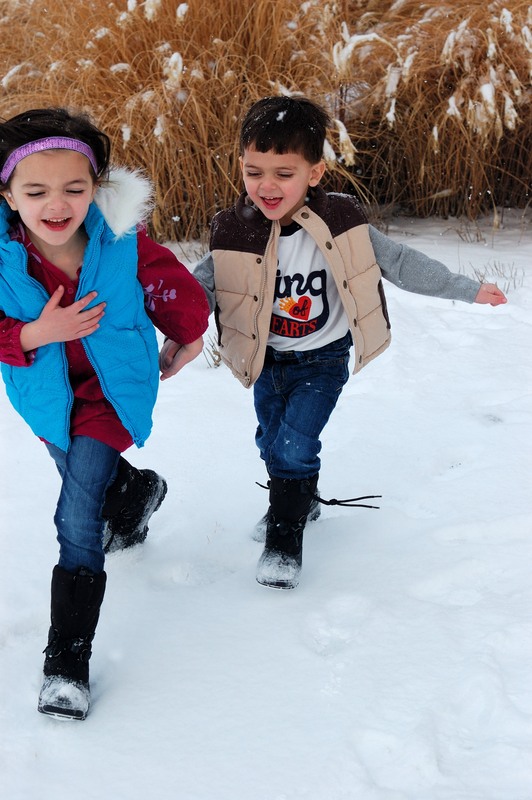 Time to get some fresh air! Yesterday, we got some beautiful snow. 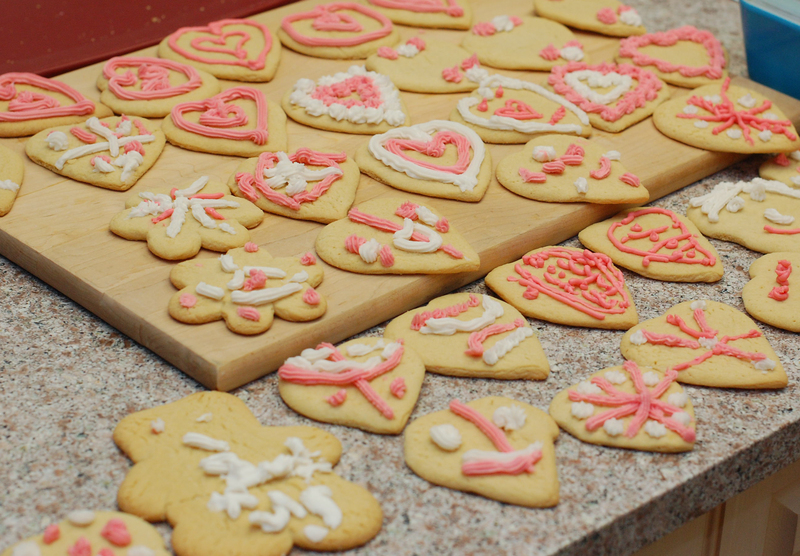 We baked heart shaped cookies and made Valentine’s too. In the middle of our crazy evening we tried another artichoke recipe for our Valentine’s Day dinner. 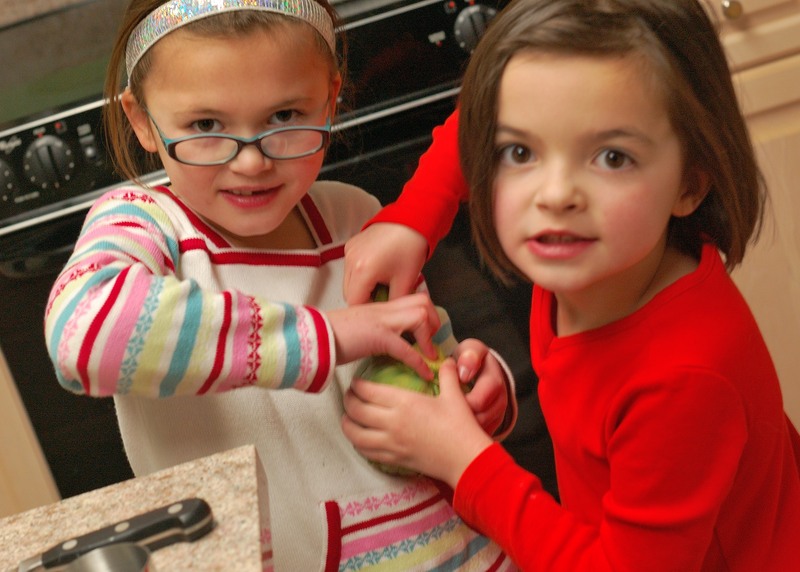 We already had the kitchen a mess from the cookie baking, so there was no way we were cutting up more fresh artichokes. 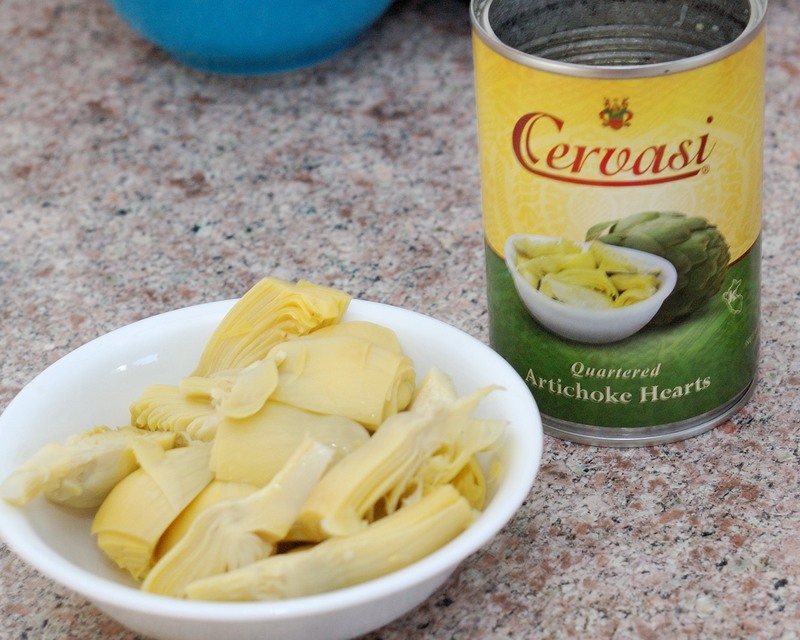 Lucky for us, this recipe called for canned artichoke hearts. Chicken, Bacon and Artichoke Pasta with Creamy Garlic Sauce from Iowa Girl Eats looked delicious, but a little bit complicated. By complicated, I mean that I had to use three of my stove burners at one time. This kind of complexity in a recipe makes me very nervous. With help from Dave, I managed to pull it all together. Theo is allergic to dairy, so we fed him some of the chicken and pasta before we added the sauce. He was not willing to eat any of the artichoke, but he did like the plain chicken and pasta. Setting aside part of a recipe before the dairy ingredients are added is something that works well for us, since the rest of us love dairy. We don’t have to make two meals and everyone feels included in what we have cooked. Josie decided to try the artichoke. Just as she suspected, she thought it was horrible. 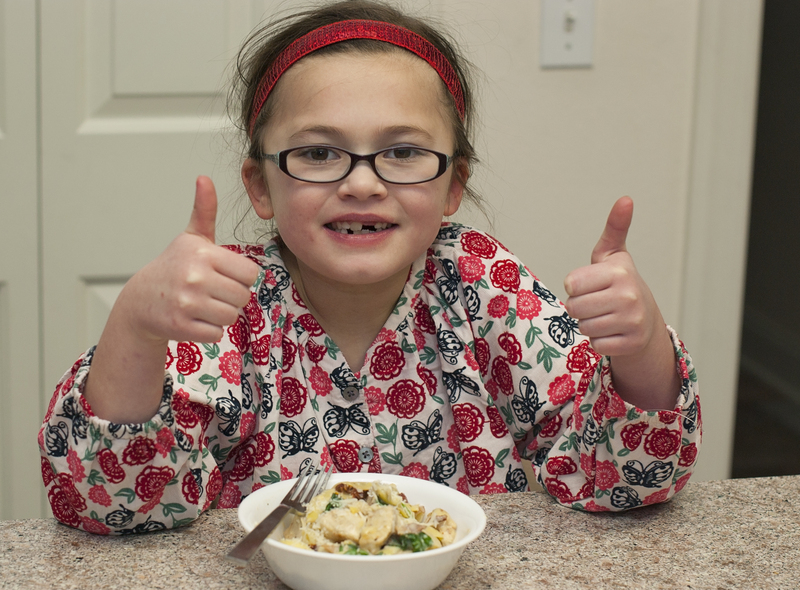 She did like the chicken and bacon part of this dish and managed to eat a few noodles. Dave and I thought this recipe was wonderful. It was a great Valentine’s Day dinner. Yum! We have two more fresh artichokes left to try. 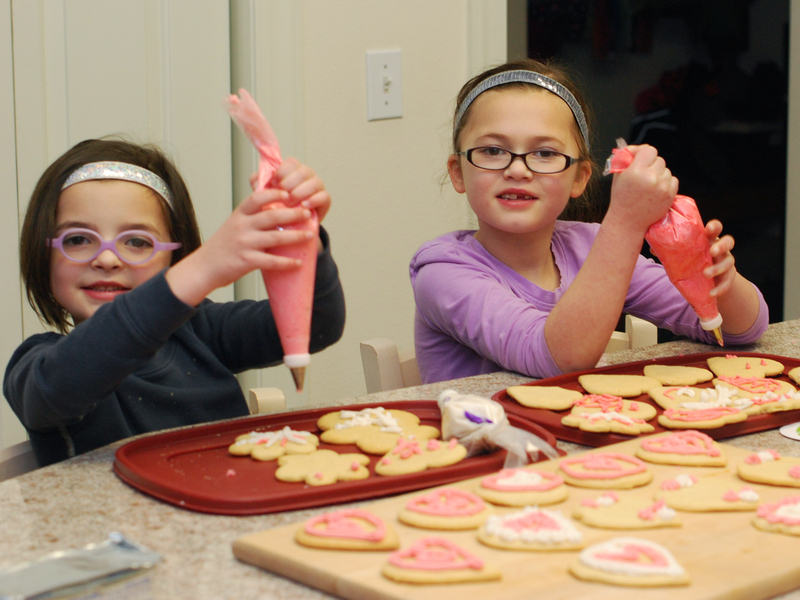 We did not get to them today, but we did ice our heart cookies. The girls did most of the decorating themselves and they are very proud! Even though Josie and Theo did not enjoy eating artichoke, they did eat other things that were cooked with artichoke. I think this is a good strategy for helping children grow accustomed to the taste of different vegetables. 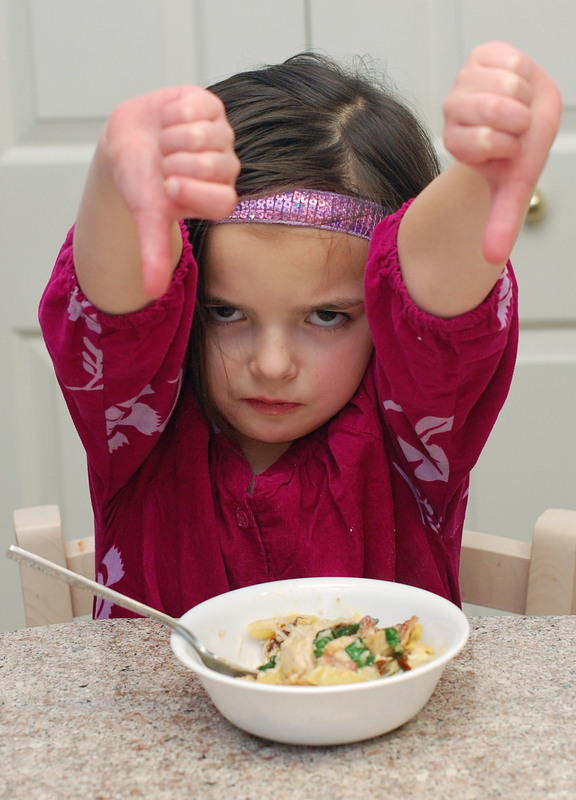 Even with two thumbs down from two kids, I consider this a positive vegetable experience. I will have to ask Lucie for her thoughts tomorrow. She is already sound asleep. Categories: Artichoke | Tags: artichoke, chicken, pasta, sun-dried tomato | Permalink. 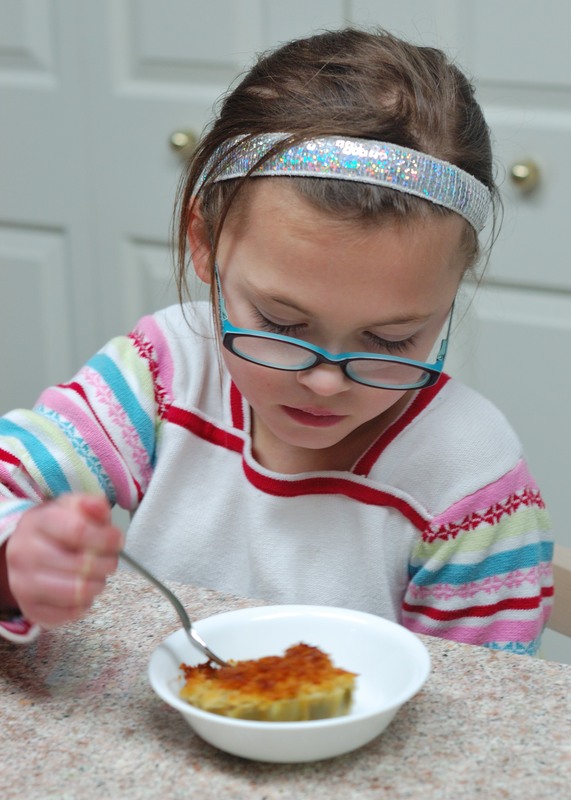 Lucie chose a recipe for parmesan stuffed artichokes from Las Vegas Food Adventures. She was really excited to get started. 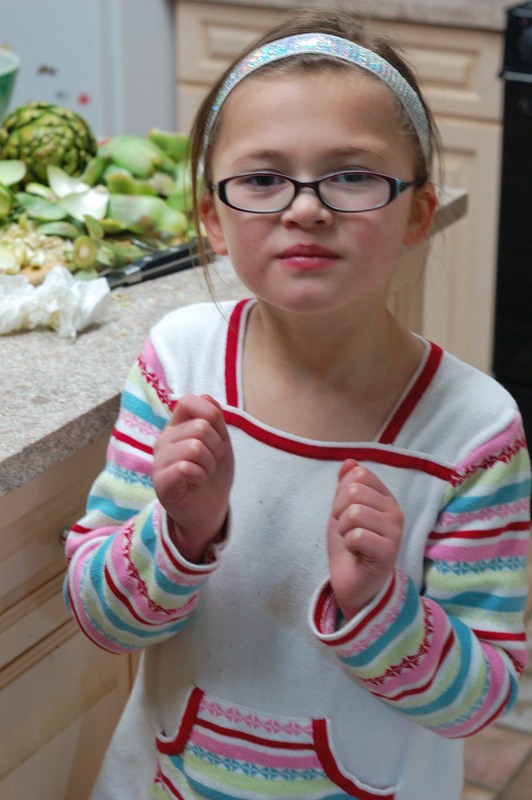 She inspected the artichokes and decided that we should start with two and save the other two for a different recipe, so we cut all of the ingredients for our recipe in half. 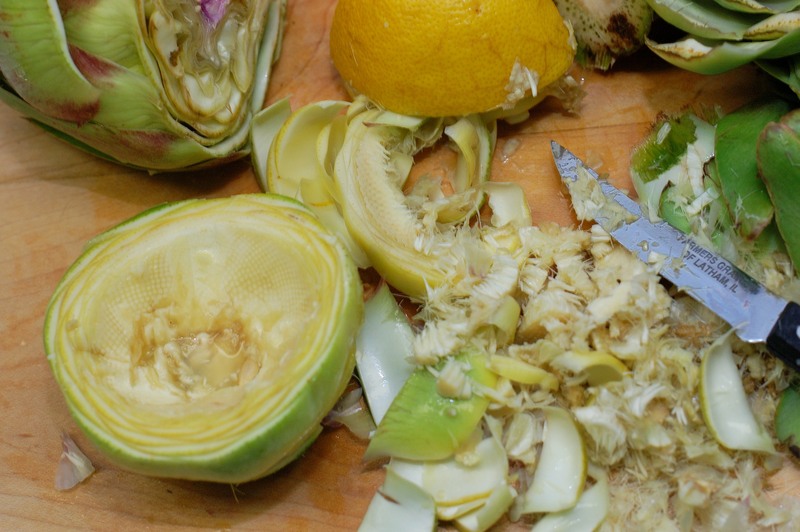 We had seen in the video that you must rub the artichoke with lemon any time you cut part of it away to prevent the artichoke from turning brown. We had our lemon sliced in half and ready to go as we began to peel away the outer leaves and cut off the stem. 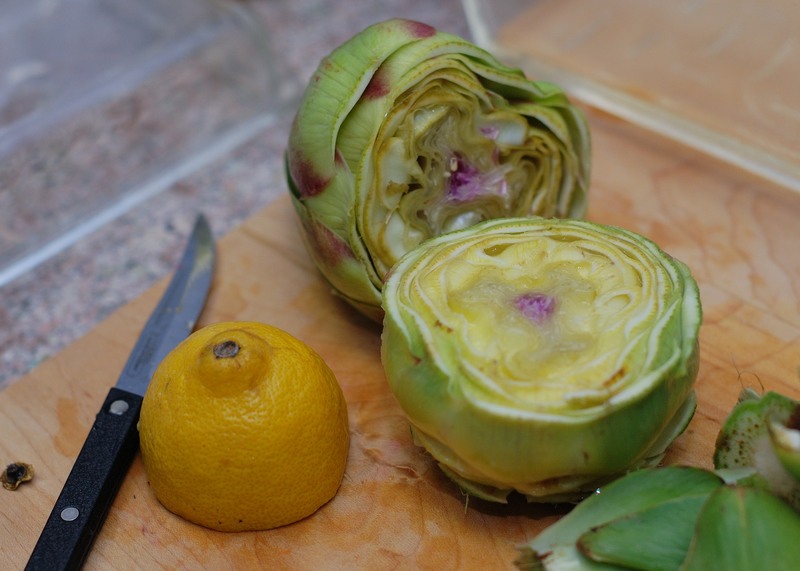 I cut off the top of the artichoke and carefully rubbed with with lemon to prevent browning. See that little purple spot in the center? The fuzzy choke beneath that is not good to eat. I decided to cut out the fuzzy choke that was mentioned in the video before cooking. After all, all I had to do was scoop it out gently with a spoon, right? Or a high powered laser. By this time, I felt that I must be doing something very wrong because I had a vegetable the size of a hockey puck left in my hand and a whole cutting board full of fuzzy stuff and discarded leaves. Dave walked through the kitchen at this point and decided he had better eat something else for supper, because “this looked too experimental”. For artichoke number two, I decided to be more conservative with the cutting. Josie could sense a disaster and came to try to help. 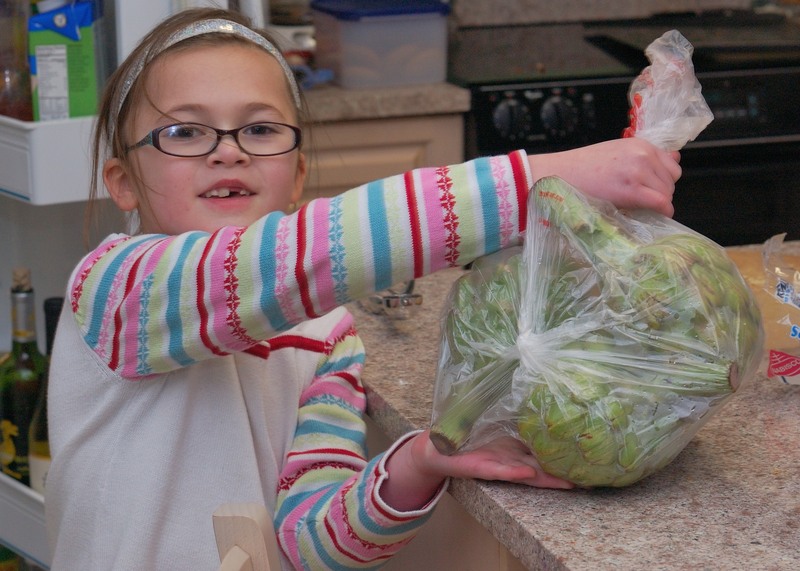 She and Lucie worked on removing the outer leaves from the next artichoke. We left the choke in this one, hoping to remove it after cooking, as the recipe recommends. 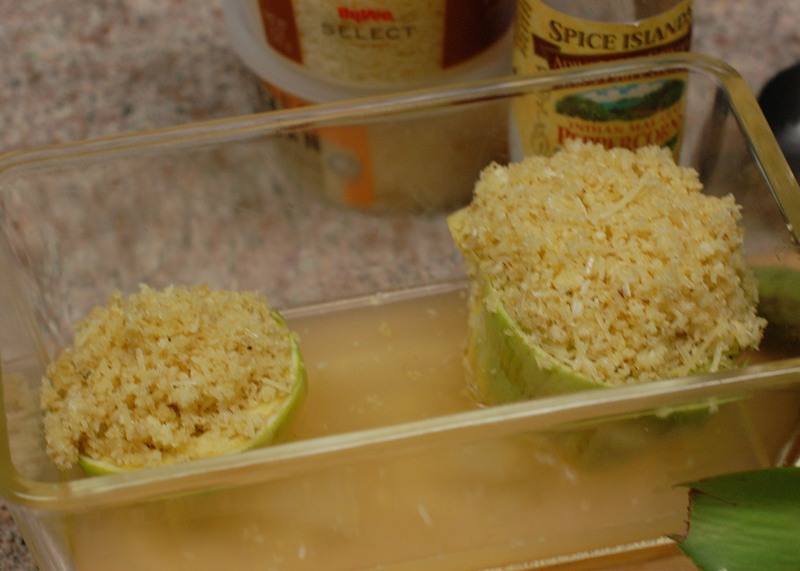 The girls stuffed them with the bread crumb mixture and we put them in the pan with white wine and chicken broth (which we used in place of water). We covered them and put them in the oven for 45 minutes at 375 degrees. They came out looking and smelling pretty good. Lucie could not wait to give them a try. She was very enthusiastic at first, but soon decided that she would rather eat something else. She decided on a one thumb up and one thumb to the side rating. I got to eat the artichoke with the choke still in it. It tasted fine and the choke was easier to remove after being cooked, but it was still a bit of a mess. 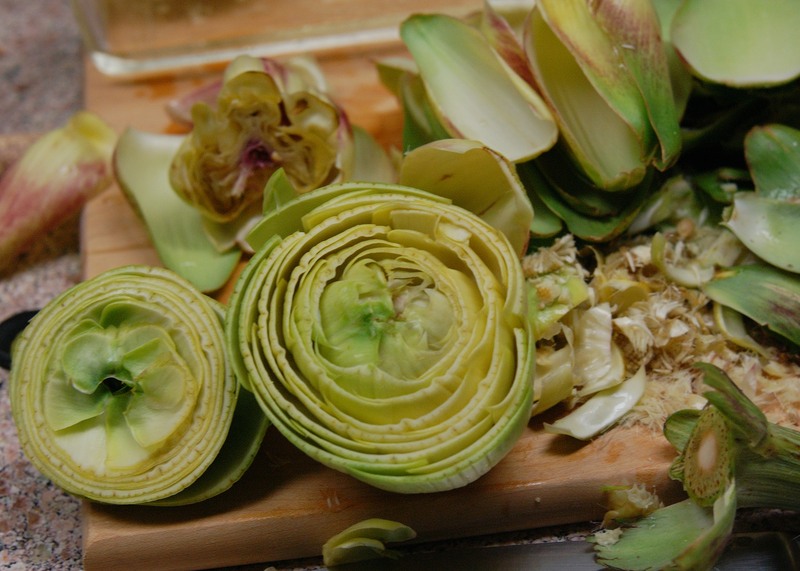 I had more of the leaves on mine, which you are supposed to use your teeth to pull the artichoke flesh from, before discarding the fibrous part. I didn’t love this process. Dave’s rating was “not too bad”. He and I both agree that we prefer the canned artichokes, both for ease of preparation and taste. To summarize, these fresh artichokes made me tired. I am looking forward to another canned artichoke recipe this week. This is Lucie trying the raw artichoke. 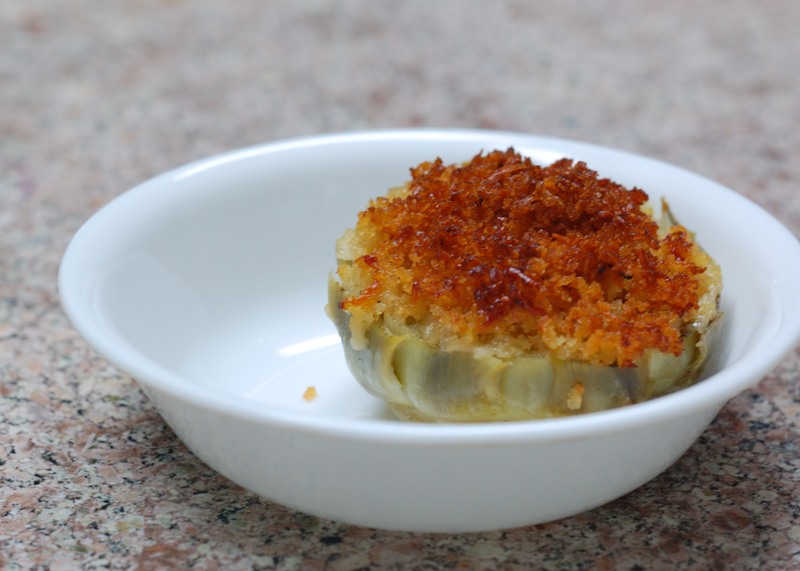 Categories: Artichoke | Tags: artichoke, parmesan | Permalink. 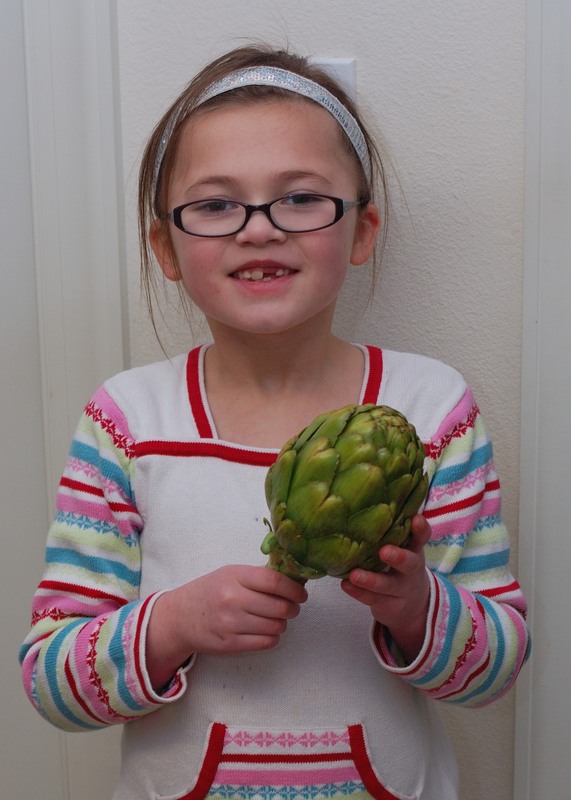 Lucie chose artichokes as our vegetable for this week. We started by doing some reading about the artichoke and learned that this funny looking vegetable is part of an immature flower from a plant in the thistle family. 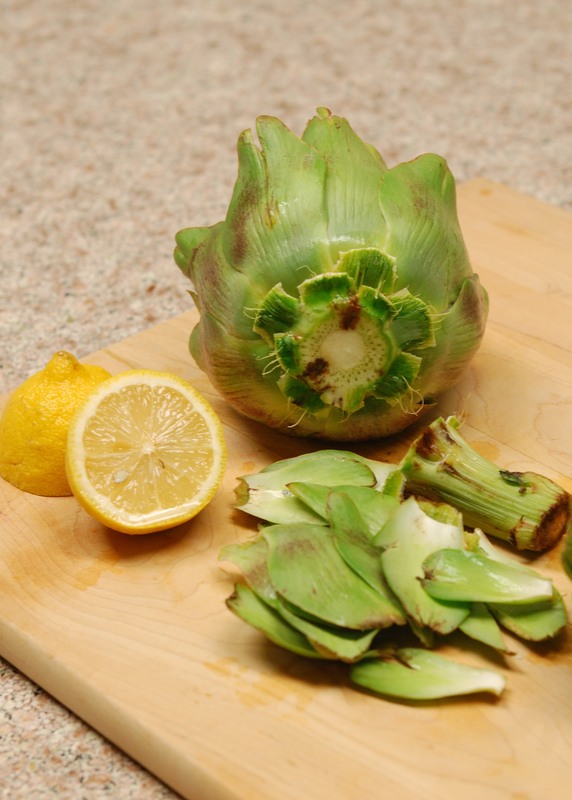 The type of vegetable we are working with this week is called a globe artichoke. Other vegetables called Jerusalem artichoke and Chinese artichoke come from the underground part of different types of plants and are not related to the globe artichoke. 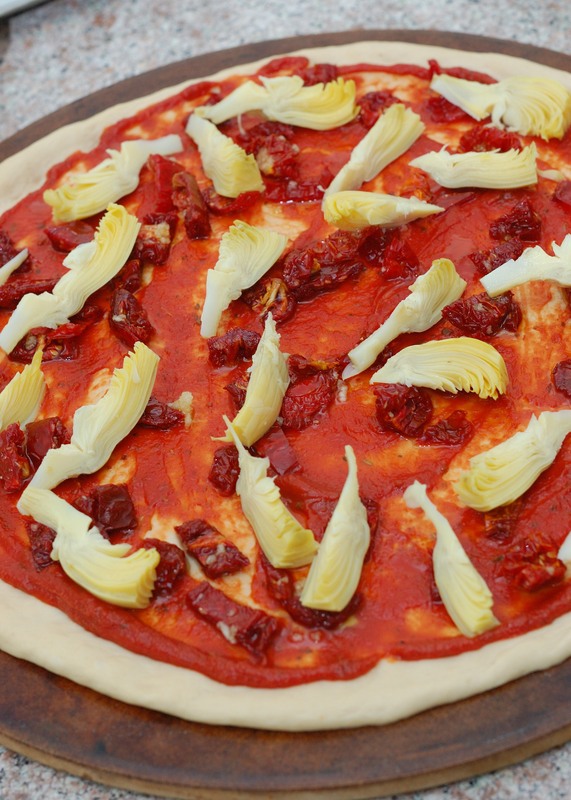 We started artichoke week with a recipe that I love: artichoke, sun-dried tomato and blue cheese pizza. 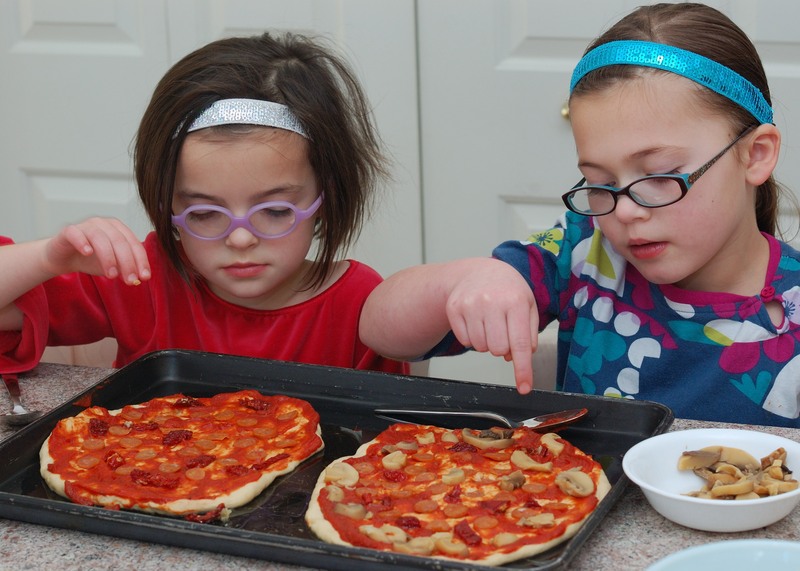 We included the kids in pizza making by giving them each their own pizza to top. 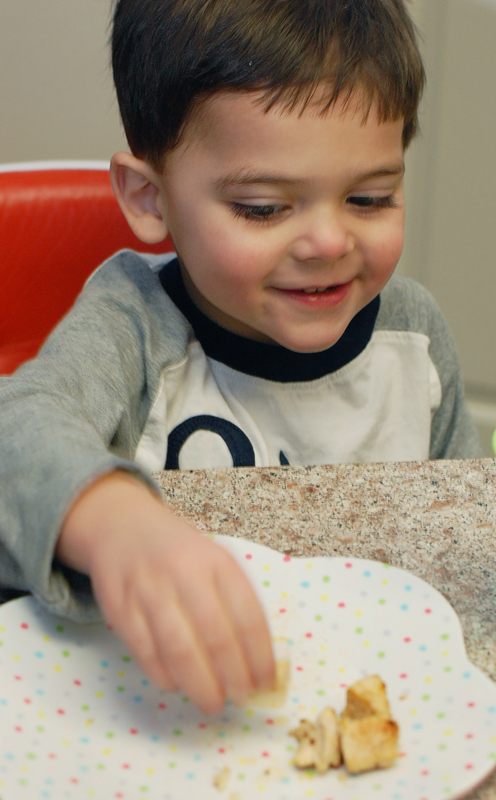 This worked very well for us because Theo is allergic to dairy. 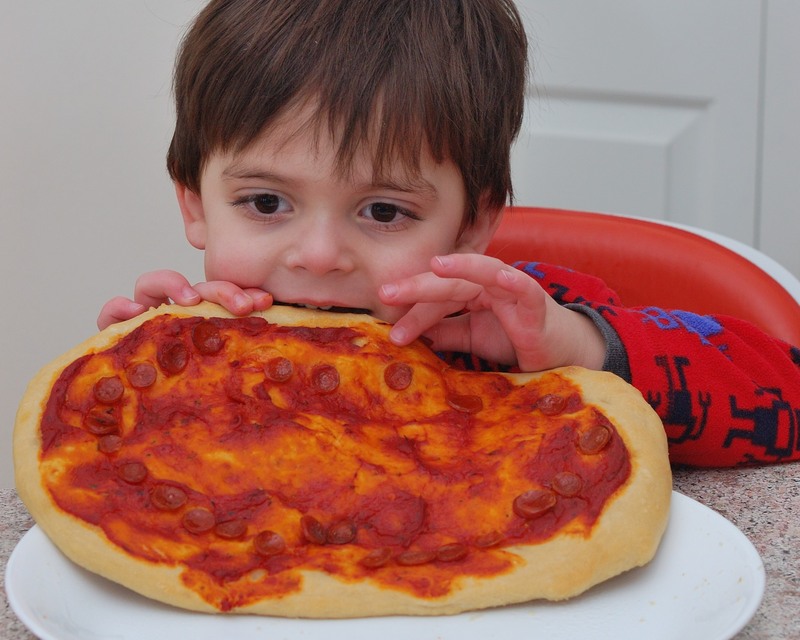 Instead of feeling left out, he was able to make his own cheese-less pizza to be proud of. This made me think of the “make your own pizza-pie” episode of Seinfeld. I found watching parts of this episode on YouTube to be a great way to procrastinate from veggie blog writing. I can assure you that the characters at my house are just as entertaining as the ones on Seinfeld. We used our favorite pizza crust recipe, Jay’s Signature Pizza Crust from allrecipes.com. 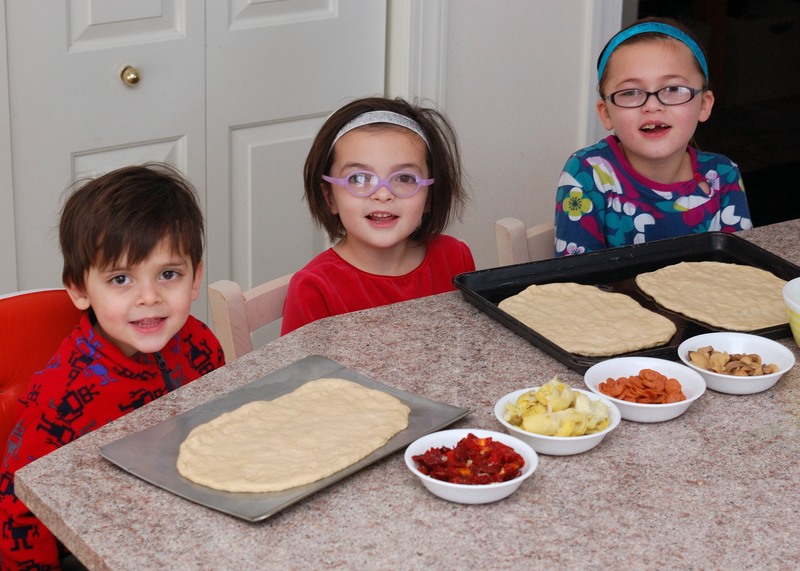 I doubled the pizza crust recipe, so we would have enough crust for three kids pizzas and two regular pizzas. 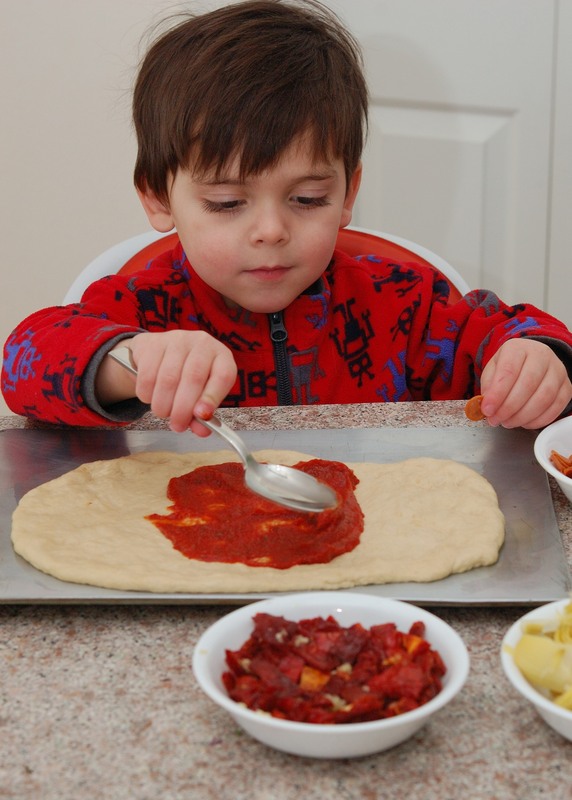 Theo was very careful adding the pizza sauce. The girls selected and arranged their toppings. I thought surely they would pile on the artichoke hearts. Lucie did decide to sample one. Theo’s pizza ended up with pizza sauce and pepperoni. 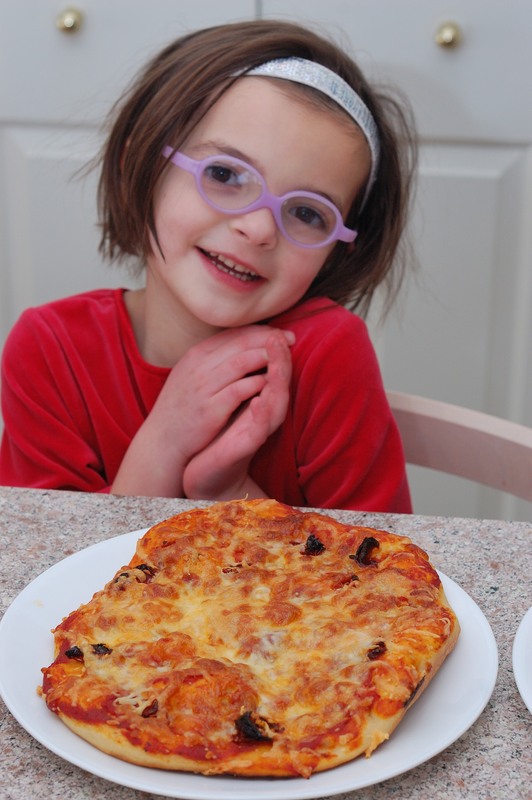 The girls’ added pizza sauce, sun-dried tomato, pepperoni and mozzarella. Lucie added a few mushrooms. Not too heavy on the veggies, but oh well. 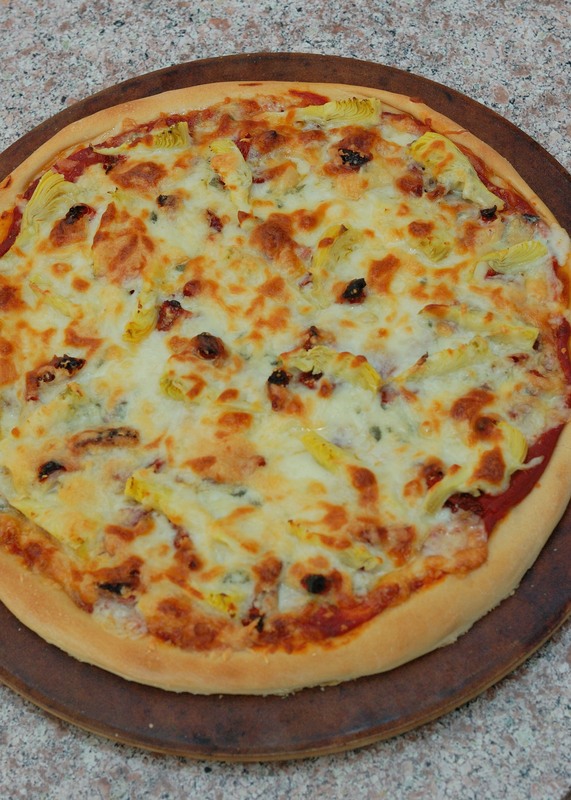 I added pizza sauce, sun-dried tomato and artichoke hearts. This is so delicious! It is my favorite kind of pizza. The girls have eaten it before and loved it. There must have been some kind of anti-artichoke attitude going around today. Theo could hardly wait to eat his pizza. Josie was very proud of her pizza. I feel like today’s post was a bit light on the artichoke. But, we have plans to tackle a real artichoke soon. We have never purchased a fresh artichoke before, so this is a bit intimidating. 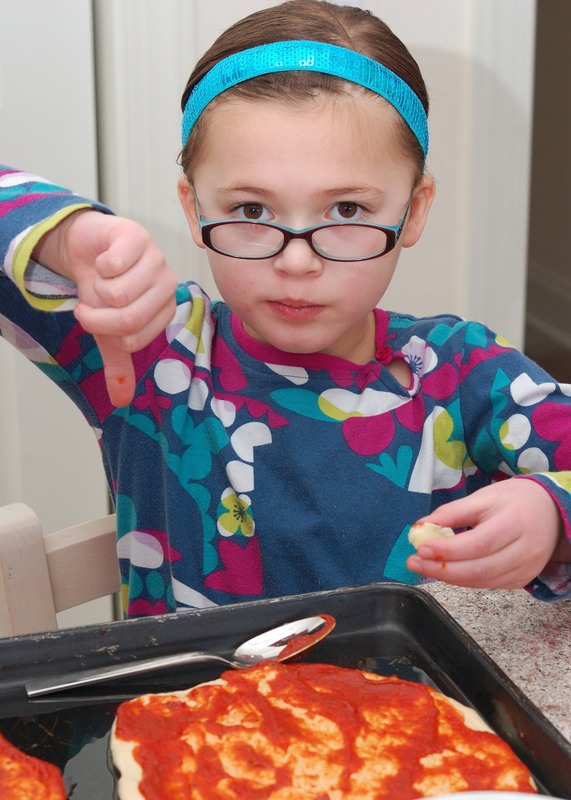 Lucie has chosen a recipe that she would like to try. I hope she likes it better than she liked plain canned artichoke heart. I did not like the canned artichoke heart that Mama had for the pizza, but I liked the pizza that I made. I like making my own pizza. Sometime I will try making a pizza with different vegetables on it. I hope we try more artichoke recipes soon. 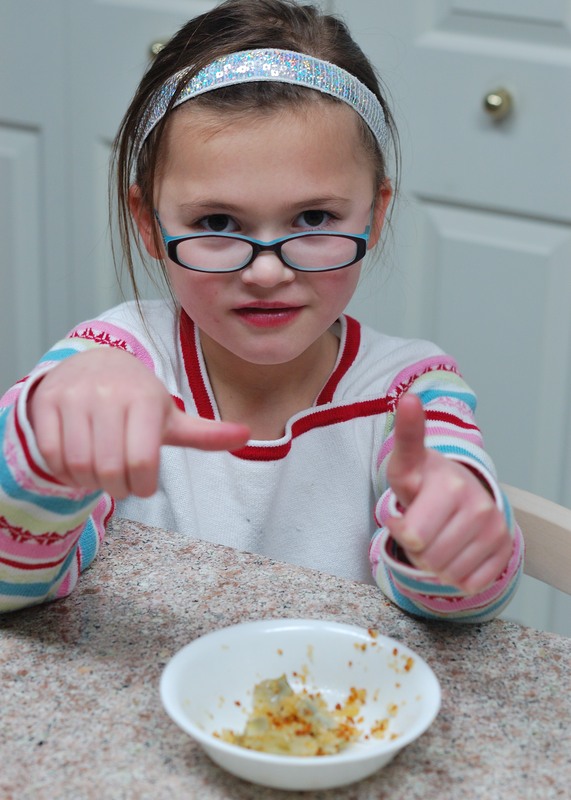 Click here to find Counting Our Veggies on Pinterest. 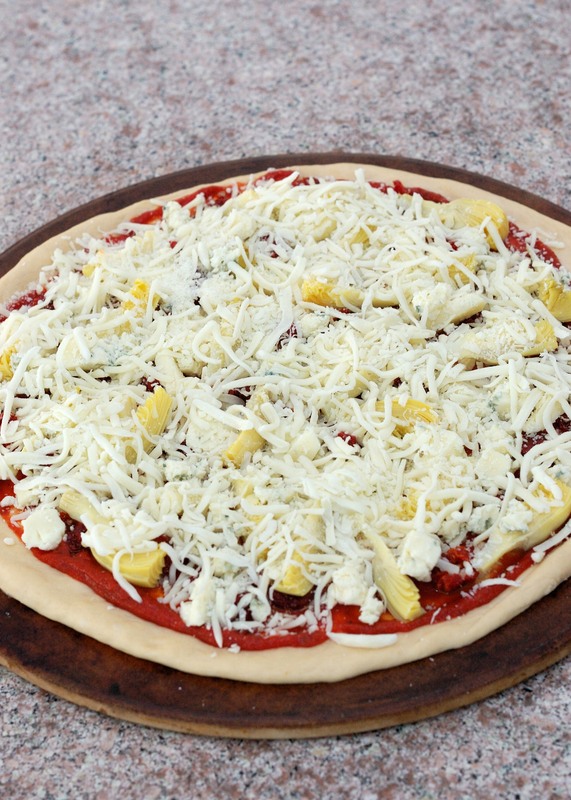 Categories: Artichoke | Tags: artichoke, blue cheese, pizza, sun-dried tomato | Permalink.